^ because building a new set of piers in the ocean for a very, very long span is extremely difficult and expensive. Plus, the LI closure was urgent/immediate. Here: calmer, shallower waters...shorter span...more reasonable to erect temporary bridge. Most likely, the temporary structure will merge into the existing bridge on the downtown side of the Charles, McInerney said. That will allow the contractor to accelerate work on the old bridge, cutting the overall construction time by six months. 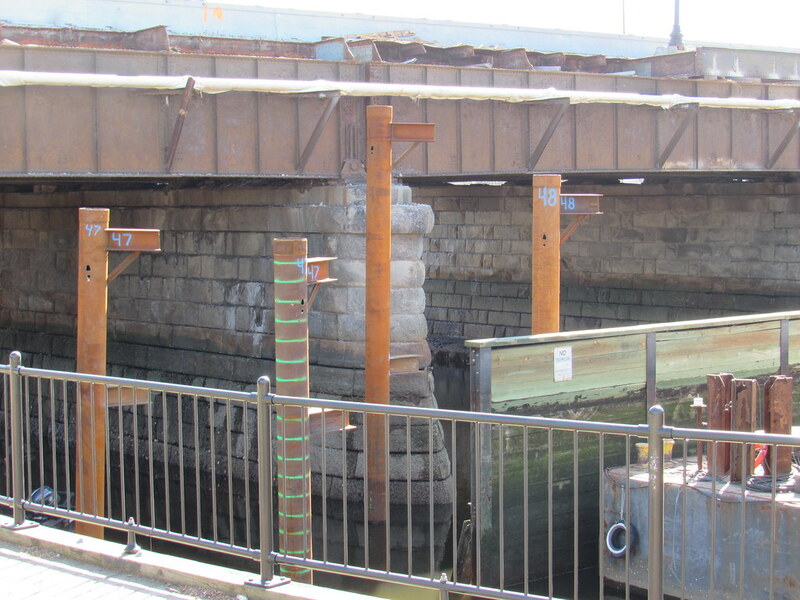 Crews have already begun working to remove and replace the utilities across the old bridge, and will dismantle and replace the bridge in stages, beginning next year. The absurd one is during Phase 2, where 1 bridge lane NB suddenly becomes 3 lanes for Rutherford Ave. I know it ultimately cuts it to two, but that seems like a missed opportunity for a road diet. When & how long will this all take place? Surely they are going to replicate this in the design, right? I don't get it, in the gondola thread people are trashing the idea because we don't need elevated systems in Boston and in this thread people are hoping for them. 1.) It is a different mode of transport, with much less capacity than a train. 2.) It is a vaporware proposal being floated so that everyone can continue to ignore practical solutions that would actually require city and state money. 3.) The gondola is being proposed over a wide right of way, that's not only capable of handling transit improvements on the ground but needs to reduce its capacity for automobiles. I don't think anyone is seriously proposing a train right of way as part of the project, people are just being nostalgic, but even so a train embankment over this bridge would still be more useful than the gondola. So was the underpass open, Beeline? I would say no. As you can see in photo #2 they have a gate they can close at any time. The day I walked by they were swinging I beams around so I did not venture any further. The workmen were also staging equipment and materials along the walkway in support of work on the seawall waterline and barges. I used the roadway to get to the other side because it looks like they have also blocked off the stairs. I was surprised at how many trees they have cut down (photo #4). I assume the playground will be removed or relocated soon. the playground is being permanently relocated towards the entrance to the locks. its a much better location for the playground. The structure being installed now in the pics will hold the temporary bridge. the underpass on the Charlestown side is not all that important, because as Beeline did, you can cross under at Water St. 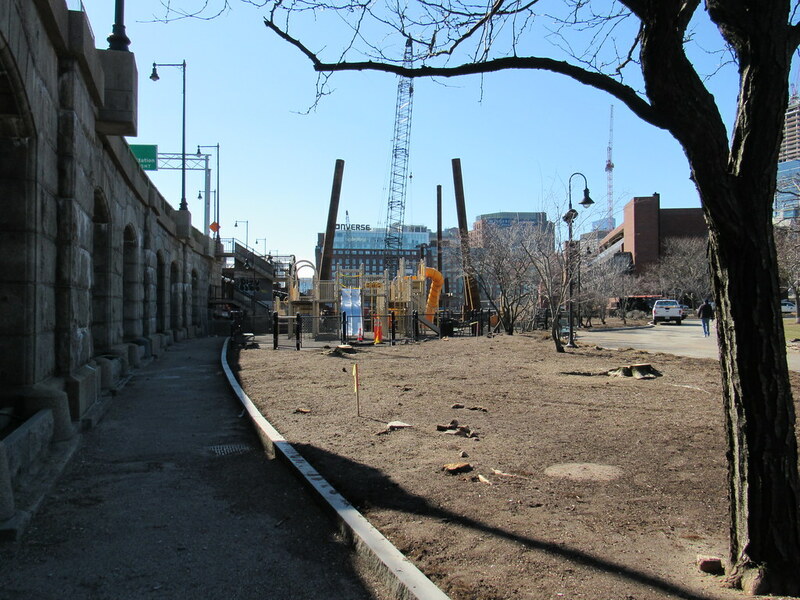 The underpass on the Boston side is not just closed, but has been removed. 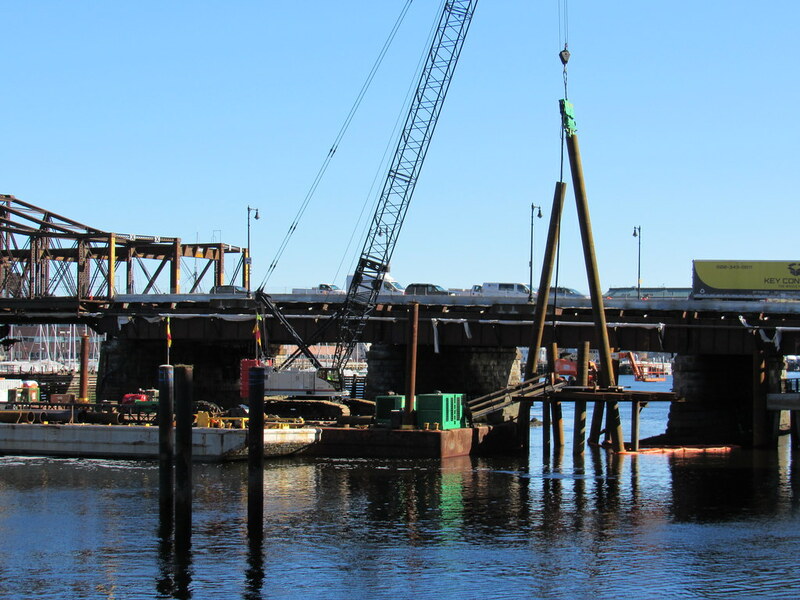 It is being reconstructed as part of the bridge project at a higher elevation for resiliency. This wasnt possible with the existing bridge structure when it was constructed 5(?) years ago. The problem with this is that the connection on the Boston side is THE bike connection. 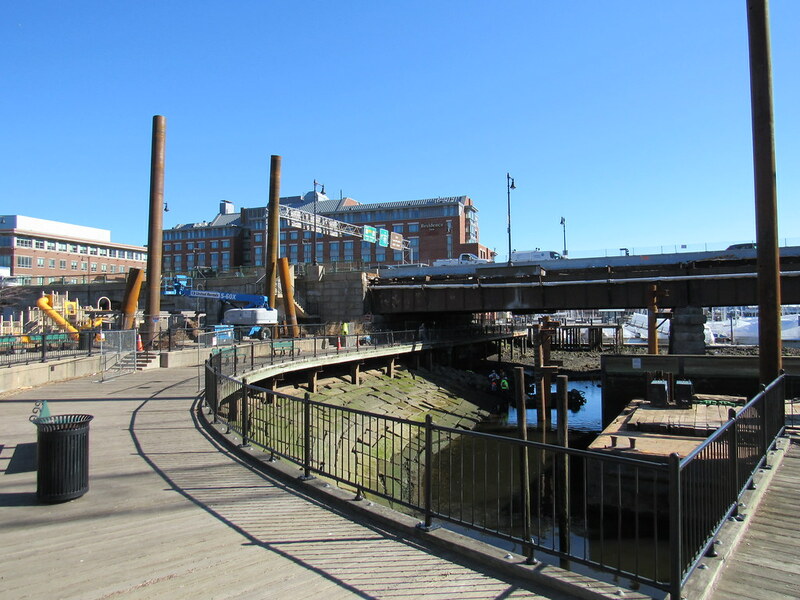 The only reason the Connect Historic Boston bike route disappears at Keany Sq is because it officially uses the Harborwalk to get through the area to connect Causeway St to Commercial St. I don't see how this was allowed because there is no safe biking alternative to cross N Washington St. The stone masonry wall in the last photo is a beauty. I hope they at least salvage the stones when they demolish it. I did a lot of stone masonry wall design for national parks, and that structures is superb. what are the other options? the connection is closed during construction of a bridge that should have been replaced 20 years ago. If I recall correctly, I've seen snow removal equipment hiding in those arches. Having been through three sets of design meetings (a BTD Causeway St design, the CHB design, and PWD North Washington Bridge design) I can tell you that vehicle LOS was the driving factor in not bringing bike lanes through Keany Sq. The BRA, as part of their Crossroads Innitiative, developed a design for Causeway St including the Keany Sq intersection that brought on street painted bike lanes through Keany Sq. In the BTD redesign of Causeway (maybe 2011, I can't find the drawings), Vehicle LOS was considered too important and the bike lanes just dissapeared in the last block(s) before Keany Sq. During the CHB process, the official line from the City was that Keany Sq would be redesigned during the North Washington St Bridge project and that the CHB bike path would head down Beverly to the boardwalk and under the bridge. And yes, they crossed their fingers that the redevelopment, or at least the boarwalk, along the water would be done by the time CHB was built. During the Boston Public Works redesign of the North Washington ST bridge, the line was that Keany Sq was beyond their scope of work.